TELECASTER TWANG. CUSTOM SHOP TONE Fender Twisted Tele pickups deliver hot high-output Telecaster guitar tone with a dash of sparkling Stratocaster® guitar character. 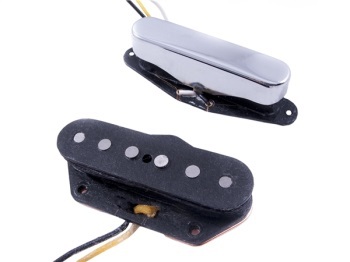 Each pickup is tailored to its position (neck and bridge) to achieve its individual sonic character. The neck pickup's taller bobbin is designed to accommodate more windings, combined with a slightly shorter bridge pickup bobbin for dark full-bodied midrange.